Flanked by the great Atlantic Ocean to the East, and False Bay to the West, the Cape Peninsula is an outstandingly beautiful rocky outcrop. The coastline rises dramatically from the ocean, sheer cliffs pointing towards Table Mountain’s summit. Culminating at Cape Point, this stretch of coastline has much to offer. From the pristine natural beauty seen in the Cape of Good Hope Nature Reserve, to the authentic South African culture experienced in the quaint town of Kalk Bay. Your peninsula tour starts with a hotel pickup, most tour operators are happy to fetch guests from hotels in and around the Cape Town City Bowl District. From there you embark on an epic journey around the Cape Peninsula. The tour starts at Camps Bay Beach before moving further down the Atlantic Coast towards Cape Point. Sit back and enjoy the view as you travel along one of the country’s most beautiful roads, sandwiched tightly between the Table Mountain and ocean. The views never end en route to Cape Point. From Table Mountain’s 12 Apostles, over Chapman’s Peak Drive and past Misty Cliffs, you are absolutely spoilt with splendid scenery. Snap a shot of the rocky terrain cascading dramatically into the Atlantic Ocean. 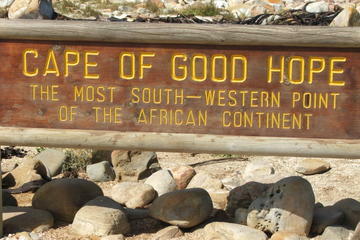 Once you reach Cape Point, you will have the chance to explore the Good Hope Nature Reserve. A vast network of hiking trails show off the many attractions found within this patch of protected land – from ostriches to shipwrecks, zebra, secret beaches and fynbos (an endemic species of flora). From Cape Point, you make your way back towards town, this time along the other side of the peninsula. A stop at Boulders Beach, made famous by the local penguin colony that call it home, is essential. Get up close and personal with these rather cheeky critters, who seem rather relaxed by the presence of humans. Post penguin petting, you will continue on your journey back towards Cape Town. This will take you through the small yet culturally rich beach towns of Simon’s Town, Kalk Bay, and Muizenberg. A stop in one of these towns, specifically Kalk Bay, should prove well worth your while. The streets are lined with quaint shops, restaurants and coffee shops. Finally, after a long day of exploring, settle down in the Constantia Valley wine region for some relaxing wine tasting. Debrief over a delectable selection of South African grapes, grown in Africa’s oldest wine region (1685). We had a fantastic day! Moritz is a great guide. We enjoyed his tour very much. We learned so much not just about the places we visited but about South Africa and the people. I am happy that we started our holiday in South Africa with his tour, as we learned much – information which was useful for our holiday. Thank you Moritz! Such a great day with Albert who was extremely nice, professional and very eager to share his knowledge and go the extra mile for his clients. He also happens to be a great photographer and will leave you with great memories 😉 We highly recommend this trip! ———- Très belle journée avec Albert, qui s’est révélé être un guide très sympathique, cultivé et extrêmement attentionné. C’est aussi un excellent photographe qui immortalisera votre journée de la meilleure manière 😉 Nous vous recommandons vivement cette excursion! Mauritz is an excellent guide! Mauritz is very knowledgeable and taught us a lot about the Cape area. I would highly recommend him. What a great day! Letitia was a wonderful guide, fun and knowledgeable, and a skilled and careful driver. We thoroughly enjoyed our outing. The sunset and our driver Grant, he has more knowledge than Google!!! We were fortunate to have Ivan as our guide who was prompt and very caring. He is from the area and is a treasure trove of information about the cape, all of our stops, and took us to a wonderful bayside stop for fresh fish and chips for lunch. One of the first stops was at Boulder’s Beach where were able to get close and watch the African penguins interact with each other. The drives around the cape were stunning and thoroughly explained by Ivan. Other highlights were slowing down for the gorillas on the road, stopping to talk with a shark spotter at one of the local beaches, amazing views, and of course the Cape of Good Hope. This tour with Ivan was such an amazing, beautiful, enlightening day. So happy and satisfied with this tour. Ivan was prompt, informative and courteous. Would recommend……………………………………………. Leonard our driver gave us a great day out. The scenery was amazing and he was very good at timing so we avoided the larger bus loads at our stops. We had lunch at a lovely restaurant right by the water and a short walk to see the penguins. On the way back we stopped at a winery. A perfect day. A fantastic day around the coast. Probably the most photogenic place in the world, truly incredible! The hike is highly recommend! don't miss out. It was a great day for this Price, Definitely recommended.